1. 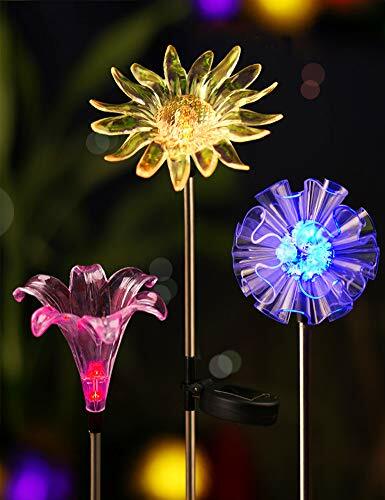 Solar LED garden lights with vivid figurines spice up your garden during the day. 2. At night, bright LED bulbs of multiple alternating colors automatically illuminate with a full charge in the sun during the day. 3. The solar changing light show will mesmerize you as you watch the starburst glisten through their bodies. 1. Electricity is converted from solar power during the day. 2. Store electricity in a rechargeable 1.2V AA 200mAH Ni-MH Battery. 3. Built-in photo sensor automatically turns the light on at dusk, creating warm and charming atmosphere in any season. 3. Solar is a clean energy and does no harm to the environment. 4. No wiring needed, fast and easy to install. 1. Make sure that the solar panel is facing the sun during installation. EYE-CATCHING SOLAR COLOR-CHANGING GARDEN STAKE LIGHTS, DAY AND NIGHT - 2.5' tall LED garden stake lights with vivid LED figurines - A delicate garden decor keeps your yard fresh in the day - At night, bright LED bulbs of multiple alternating colors automatically illuminate with a full charge in the sun during the day - The solar changing light show will mesmerize you as you watch the starburst glisten through their bodies. SOLAR POWERED & LIGHT SENSORED - A renewable and clean energy - powered by electricity, converted from solar power during the day - stored in a rechargeable 1.2V AA 200mAH Ni-MH Battery - Runs up to 8 hours with a full charge of sun light - With light sensored, the light will automatically light up and change color every night - Creates warm and charming atmosphere in any season. DURABLE & ECONOMIC - The bright long lifespan LED bulb produces no heat after long-time use - LED figurines made from polystyrene - lightweight, stain and water resistant, BPA free - Stainless steel pole stake - corrosion resistant, and durable - Solar panels take up less space, giving you a stronger and more efficient charge. VERSATILE - Fast and easy to install - No wiring needed and provide a calm color light show anywhere throughout the night - Available in a wide variety of design to decorate your garden, lawn, patio, yard, etc. - Anywhere actually as long as power-charged the light via the sun - Comes in a gift box, ready for gift giving to colleagues, friends and loved ones.